Using the wrong brushing technique can wear down your gums and makes you more susceptible to cavities, tooth decay and gum disease. Here’s the list of common mistakes people make while brushing teeth and how to correct them. Brushing teeth immediately after meal can be damaging for your tooth. During this time, the pH-level in your mouth is lower than normal, and more acidic, so brushing can be very abrasive and harmful. If you’ve consumed anything acidic, you should avoid brushing your teeth for at least 30 minutes. Foods containing citric acid, like oranges, grapefruits and lemons, weaken tooth enamel. Brushing your teeth immediately after eating can damage the tooth enamel in its weakened state. The average person’s brushing time is only 45 seconds, but the dentist-recommended amount of time is 2 minutes. Anything shorter than 2 minutes doesn’t give the fluoride in your toothpaste enough time to attach to your tooth enamel. Brushing your teeth for 2 minutes is usually sufficient to remove plaque. Most dental professionals recommends a brush with soft, round-ended nylon bristles. It should be sturdy enough to remove plaque plaque and debris from your teeth but not hard enough to damage the teeth when used properly. Brushes with medium or hard bristles used with some force can remove the protective enamel coating your teeth. This results in sensitive teeth and gums that hurt when you drink something cold. Most dentists recommends changing your toothbrush every three to four months. Old toothbrushes are much less effective at removing plaque from teeth and gums compared to new ones. The bristles become frayed and less effective in getting to all those tricky corners around your teeth. Use only sufficient pressure when brushing your teeth in order to effectively clean them, brushing too hard can damage the teeth and erode gums. Many people brush their teeth at straight, right angles to the teeth. This may be the cause of tearing of the tooth enamel. Tilt your brush at a 45-degree angle to your gums, and make an up-and-down motion. Use short back-and-forth strokes. Use the same method on the inside surfaces of all your teeth. Brushing the teeth from side-to-side or straight-up-and-down motion is a common mistake many people make. This can cause erosion of the tooth enamel. 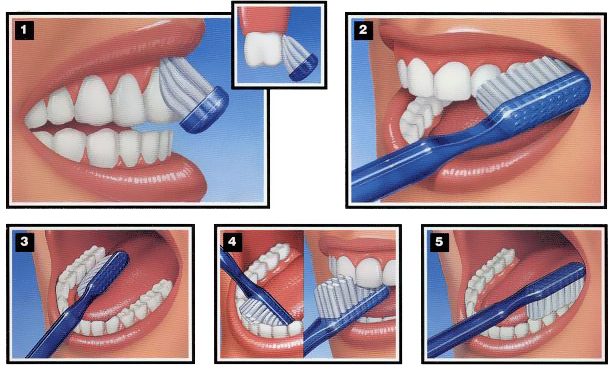 Instead of brushing in long strokes, brush your teeth in a gentle, circular motion. Tooth brush bristles often cannot reach in between your teeth, where food and bacteria can build up and develop into tartar. This can eventually lead to tooth decay. Flossing gets between your teeth and remove plague from areas where toothbrushes can’t reach. Flossing can prevent cavities and gum disease.